"De Niro" redirects here. For other people with the surname, see De Niro (surname). Robert Anthony De Niro (/dəˈnɪroʊ/; born August 17, 1943) is an American actor and producer who has both Italian and American citizenship. He was cast as the young Vito Corleone in the 1974 film The Godfather Part II, for which he won the Academy Award for Best Supporting Actor. His longtime collaboration with director Martin Scorsese earned him the Academy Award for Best Actor for his portrayal of Jake La Motta in the 1980 film Raging Bull. He received the AFI Life Achievement Award in 2003, the Golden Globe Cecil B. DeMille Award in 2010, and the Presidential Medal of Freedom from President Barack Obama in 2016. De Niro's first major film roles were in the sports drama, Bang the Drum Slowly (1973) and Scorsese's crime film Mean Streets (1973). He earned Academy Award nominations for the psychological thrillers Taxi Driver (1976) and Cape Fear (1991), both directed by Scorsese. De Niro received additional nominations for Michael Cimino's Vietnam war drama, The Deer Hunter (1978), Penny Marshall's drama Awakenings (1990), and David O. Russell's romantic comedy-drama, Silver Linings Playbook (2012). His portrayal of gangster Jimmy Conway in Scorsese's crime film, Goodfellas (1990), and his role in black comedy film The King of Comedy (1983), earned him BAFTA Award nominations. 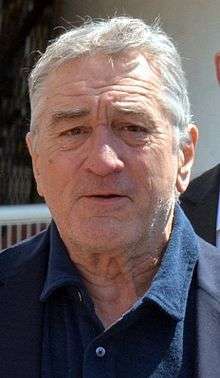 De Niro has earned four nominations for the Golden Globe Award for Best Actor – Motion Picture Musical or Comedy, for his work in the musical drama New York, New York (1977), the action comedy Midnight Run (1988), the gangster comedy Analyze This (1999), and the comedy Meet the Parents (2000). Other notable performances include roles in Once Upon a Time in America (1984), Brazil (1985), The Untouchables (1987), Heat (1995), Casino (1995), Cop Land (1997), Jackie Brown (1997) and Machete (2010). He has directed and starred in films such as the crime drama A Bronx Tale (1993), and the spy film The Good Shepherd (2006). Robert Anthony De Niro was born in the Greenwich Village area of Manhattan, New York, the son of Virginia Admiral and Robert De Niro Sr. Both of his parents were painters; his father was of half Italian and half Irish descent, while his mother was of half German ancestry, with her other roots being French, English and Dutch. De Niro's parents, who had met at the painting classes of Hans Hofmann in Provincetown, Massachusetts, divorced when he was two years old after his father announced that he was gay. De Niro was raised by his mother in the Greenwich Village and Little Italy areas of Manhattan. His father lived within walking distance and De Niro spent much time with him as he grew up. His mother was raised Presbyterian but became an atheist as an adult, while his father was a lapsed Catholic since the age of 12. Against his parents' wishes, his grandparents had him secretly baptized into the Catholic Church while he was staying with them during his parents' divorce. De Niro attended PS 41, a public elementary school in Manhattan, through the sixth grade. He then went to Elisabeth Irwin High School, the private upper school of the Little Red School House, for the seventh and eighth grades. He was accepted into the High School of Music and Art for the ninth grade, but only attended for a short time before transferring to a public junior high school. De Niro began high school at the private McBurney School and later attended the private Rhodes Preparatory School, although he never graduated from either. Nicknamed "Bobby Milk" for his pallor, De Niro hung out with a group of street kids as a youth in Little Italy, some of whom have remained his lifelong friends. The direction of his future had already been foreshadowed by his stage debut at age 10, when he played the Cowardly Lion in a school production of The Wizard of Oz. Along with finding relief from shyness through performing, he was also fixated by cinema, and he dropped out of high school at age 16 to pursue acting. He studied acting at the Stella Adler Conservatory, as well as Lee Strasberg's Actors Studio. De Niro's first film role came at the age of 20, when he appeared in Brian De Palma's 1963 film The Wedding Party, but the film was not released until 1969. He then appeared in Roger Corman's film Bloody Mama (1970). He gained popular attention with his role as a dying Major League Baseball player in Bang the Drum Slowly (1973) and began his collaboration with Martin Scorsese when he played the small-time criminal Johnny Boy in Mean Streets (1973). De Niro had a pivotal role in the Francis Ford Coppola film The Godfather Part II (1974), playing the young Vito Corleone. Coppola had remembered his previous auditions for the roles of Sonny Corleone, Michael Corleone, Carlo Rizzi, and Paulie Gatto in The Godfather. His performance earned him his first Academy Award, for Best Supporting Actor, although Coppola accepted the award as De Niro was not present at the ceremony. De Niro became the first actor to win an Academy Award speaking mainly a foreign language. In this case, several Sicilian dialects, although he delivered a few lines in English. He and Marlon Brando, who played the older Vito Corleone in the first film, are the only actors to have won Oscars for portraying the same fictional character. After working with Scorsese in Mean Streets, De Niro went on to have a successful working relationship with him in films such as Taxi Driver (1976), New York, New York (1977), Raging Bull (1980), The King of Comedy (1983), Goodfellas (1990), Cape Fear (1991), and Casino (1995). They also acted together in Guilty by Suspicion (1991) and provided their voices for the animated feature Shark Tale (2004). Taxi Driver was particularly important to De Niro's career. His iconic performance as Travis Bickle catapulted him to stardom and forever linked his name with Bickle's famous "You talkin' to me?" monologue, which De Niro largely improvised. The role of Bickle earned him his first Academy Award Nomination for Best Actor. His portrayal of Jake LaMotta in Raging Bull was lauded, as well as his interpretation of Max Cady in Cape Fear. In 1976, De Niro appeared in 1900, Bernardo Bertolucci's biographical exploration of life in Italy before World War II, seen through the eyes of two Italian childhood friends at the opposite sides of society's hierarchy. He also starred in The Last Tycoon (1976), directed by Elia Kazan. Kazan recalls that De Niro "would do almost anything to succeed" and noted that he cut his weight down from 170 to 128 pounds for the role in this film. Kazan adds that De Niro "is one of a select number of actors I've directed who work hard at their trade, and the only one who asked to rehearse on Sundays. Most of the others play tennis. Bobby and I would go over the scenes to be shot. Bobby is more meticulous... he's very imaginative. He's very precise. He figures everything out both inside and outside. He has good emotion. He's a character actor: everything he does he calculates. In a good way, but he calculates. ":766 Kazan developed and used those personality traits for his character in the film. :766 And although the film did poorly at the box office, reviewers praised De Niro's acting. Film critic Marie Brenner wrote that "for De Niro, it is a role that surpasses even his brilliant and daring portrayal of Vito Corleone in The Godfather Part II... his performance deserves to be compared with the very finest". De Niro played Michael Vronsky in the acclaimed Vietnam War film The Deer Hunter (1978), for which he was nominated for Best Actor in a Leading Role. Fearing he had become typecast in mob roles, he began expanding into occasional comedic roles in the mid-1980s and has had much success there as well, with such films as Brazil (1985), Midnight Run (1988), Analyze This (1999), Meet the Parents (2000), and Meet the Fockers (2004). Other films include True Confessions (1981), Falling in Love (1984), Once Upon a Time in America (1984), The Mission (1986), Angel Heart (1987), The Untouchables (1987), Goodfellas (1990), Awakenings (1990), Heat (1995), The Fan (1996), Sleepers (1996), Wag the Dog (1997), Jackie Brown (1997), Ronin (1998) and Flawless (1999). In 1987, De Niro was the President of the Jury at the 15th Moscow International Film Festival. He appeared in This Boy's Life (1993). Around this time, he was offered the role of Mitch Leary in In the Line of Fire (1993). However, due to scheduling conflicts with his directorial debut A Bronx Tale (1993), he gave up the role to John Malkovich, who later received an Academy Award nomination for it. In A Bronx Tale, which De Niro agreed to direct after seeing the screenwriter's one-man off-Broadway play, he played a bus driver who struggles to keep his son away from a local mobster. At the 20th Moscow International Film Festival in 1997, he was awarded an Honorable Prize for contribution to cinema. De Niro would reference In the Line of Fire, along with Dirty Harry (1971) and Magnum Force (1973), two more of Eastwood's films, in Righteous Kill (2008). He also appeared in the crime drama Cop Land (1997). He starred in the police action-thriller Heat (1995), along with fellow actor and long-time friend, Al Pacino. The duo drew much attention from fans, as both have generally been compared throughout their careers. Though Pacino and De Niro both starred in The Godfather Part II (1974), they shared no screen time. They once again appeared together in Righteous Kill (2008). De Niro played Master Chief Billy Sunday in the biographical film Men of Honor (2000), based on the life of Carl Brashear, the first African American to become a U.S. Navy Master Diver. He also hosted 9/11 (2002), a documentary about the 9/11 attacks, shown on CBS and focusing on video footage made by Jules and Gedeon Naudet that showed the role of firefighters following the attacks. He reprised his role as Jack Byrnes in Meet the Fockers (2004) and was featured in Stardust (2007). All of the films were successful at the box office, but received mixed reviews. De Niro had to turn down a role in The Departed (2006) due to commitments with preparing The Good Shepherd (2006). He said: "I wanted to. I wish I could've been able to, but I was preparing The Good Shepherd so much that I couldn't take the time to. I was trying to figure a way to do it while I was preparing. It just didn't seem possible." In June 2006, it was announced that De Niro had donated his film archive (including scripts, costumes, and props) to the Harry Ransom Center at the University of Texas at Austin. On April 27, 2009, it was announced that the De Niro collection at the Ransom Center was open to researchers and the public. De Niro directed and starred in The Good Shepherd (2006). The film reunited him onscreen with Joe Pesci, with whom he had starred in Raging Bull, Goodfellas, A Bronx Tale, Once Upon a Time in America, and Casino. De Niro announced that he would appear in the film version of the BBC crime series Edge of Darkness in 2010. However, just after he arrived to begin shooting, De Niro left the film due to creative differences. He was replaced by Ray Winstone. He appeared as Senator John McLaughlin in the action film Machete (2010), and starred in the thriller Stone (2010). He again reprised his role as Jack Byrnes in Little Fockers (2010). He appeared in the action film Killer Elite (2011), Limitless (2011) and the romantic comedy film New Year's Eve (2011). De Niro starred in the film Manuale d'amore 3 (2011). In January 2011, CBS picked up De Niro's crime pilot, NYC 22 (originally titled Rookies), but it was cancelled after airing only four episodes. In 2011, De Niro was the President of the Jury for the 64th Cannes Film Festival. In 2012, he starred in the films Silver Linings Playbook, Freelancers, Red Lights, and Being Flynn. He received a nomination for an Academy Award for Best Supporting Actor for his role in Silver Linings Playbook. On April 8, 2015, De Niro revealed that he'll play Enzo Ferrari in a movie to be released in 2016. De Niro's capital ventures have included co-founding the film studio TriBeCa Productions, the Tribeca Film Festival, the restaurants Nobu and Tribeca Grill (which he co-owns with Broadway producer Stewart F. Lane), The Greenwich Hotel (located in Tribeca), and the restaurant inside the hotel, Locanda Verde (run by executive chef and co-owner Andrew Carmellini). According to the July 2010 issue of Gourmet magazine, De Niro is in negotiations with an internationally renowned chef, Natalia Jibladze, to launch an as-yet-unnamed restaurant in Manhattan under his Tribeca trademark. When in Malaysia in 2010, he dined with the Malaysian Prime Minister's wife and was asked to open a Malay restaurant in Alor Setar, Kedah. Praised for his commitment to roles, stemming from his background in method acting, De Niro gained 60 lb (27 kg) and learned how to box for his role as Jake LaMotta in Raging Bull, ground his teeth for Cape Fear, lived in Sicily for The Godfather Part II, worked as a cab driver for a few weeks for Taxi Driver, and learned to play the saxophone for New York, New York. He again put on weight for his performance as Al Capone in The Untouchables (1987). De Niro's brand of method acting includes employing whatever extreme tactic he feels is necessary to elicit the best performance from those with whom he is working. During the filming of The King of Comedy, he directed a slew of anti-Semitic epithets at co-star Jerry Lewis to enhance and authenticate the anger demonstrated by Lewis' character. According to People magazine, the technique was successful, with Lewis recalling: "I forgot the cameras were there... I was going for Bobby's throat." De Niro married his first wife, Diahnne Abbott, in 1976. They have a son, Raphael, a former actor who works in New York real estate. De Niro also adopted Abbott's daughter Drena De Niro from a previous relationship. They divorced in 1988. De Niro has twin sons Aaron Kendrick and Julian Henry de Niro conceived by in vitro fertilization and delivered by a surrogate mother in 1995, from a long relationship with former model Toukie Smith. In 1997, De Niro married his second wife, actress Grace Hightower, at their Marbletown home. Their son Elliot was born in 1998 and the couple split in 1999. The divorce was never finalized and in 2004 they renewed their vows. In December 2011, a daughter named Helen Grace was born via surrogate. In addition to his six children, De Niro has four grandchildren, one from his daughter Drena and three from his son Raphael. De Niro announced on March 25, 2016 that his son, Elliot, has autism and explained his interest in its causes and treatment. It was reported in October 2003 that De Niro had been diagnosed with prostate cancer. He underwent surgery at the Memorial Sloan-Kettering Cancer Center in December 2003. De Niro, who has long resided in New York City, has been investing in Manhattan's Tribeca neighborhood since 1989. He has residences on the east and west sides of Manhattan. He also has a 78-acre (32 ha) estate in Gardiner, New York, which serves as his primary residence. During a film shoot in France in February 1998, De Niro was questioned as a witness about the Bourgeois prostitution ring. De Niro denied any involvement, later filing a complaint. Despite saying at the time that he would not return to France, he later filmed there and presided over the jury at the 2011 Cannes Film Festival. In 2006, the trust that owns De Niro's Gardiner estate sued the town to have its property tax assessment reduced, arguing that, at $6 million, it was too high and should be compared only with similar properties in Ulster County, where Gardiner is located. The town, which had been comparing its value to similar estates in Dutchess County, across the Hudson River, and Connecticut's Litchfield County, east of Dutchess, where many other wealthy New York City residents maintain estates on large properties, won in State Supreme Court. But in 2014, the trust's lawyers appealed the decision and the town was unsure if it should continue to defend the suit because of its own financial limitations (it would have earned far less in payments on the increased taxes than it had spent in legal bills). This has made many residents, who initially sympathized with De Niro, angry, and some proposed to raise money privately to help the town continue the suit. A local newspaper's report on the continued dispute was picked up by The New York Times and made international news. "When he read about it on Election Day, he went bananas," due to the negative publicity, said Gardiner town councilman Wiegand. He had apparently been unaware that the trust had filed the lawsuit. Its accountants took the blame, citing their fiduciary duty. A short time later, his lawyer met with town officials, at De Niro's direction, and offered them withdrawal of the suit and $129,000 in reimbursement for the town's legal bills, paid by the accounting firm. "[He] made it very clear that De Niro didn't want to screw the town, that he didn't know about any of it and that he wanted it settled as quickly as possible," Wiegand said. In 1998, he lobbied Congress against impeaching President Bill Clinton. While promoting the film The Good Shepherd with co-star Matt Damon on the December 8, 2006, episode of Hardball with Chris Matthews at George Mason University, De Niro was asked whom he would like to see as President of the United States. De Niro responded, "Well, I think of two people: Hillary Clinton and Obama." On February 4, 2008, De Niro supported Obama at a rally at the Izod Center in New Jersey before Super Tuesday. In 2012, De Niro joined the anti fracking campaign Artists Against Fracking. During the 2016 presidential campaign, De Niro was an outspoken critic of candidate Donald Trump, calling him "so blatantly stupid" and stating "I'd like to punch him in the face" in reference to the similar desire Trump expressed towards the DNC speakers at one of his rallies. De Niro was raised by an atheist mother and a lapsed Catholic father who left the Catholic Church at age 12. His grandparents had him secretly baptized Catholic, and his grandmother was the main advocate of Catholicism in the family. He refuses to be asked about religion in interviews. Last Temptation was something I was never interested in doing. But I did tell [Scorsese], 'If you really have a problem, if you really want to do it, and you need me, I'll do it. If you're against the wall and have no other way, I'll do it as a friend. I was not interested in playing Christ. It's like playing Hamlet. I just didn't want to do it. Marty and I talked about it. We do things with each other because we like to work together, but also for our separate reasons. I have mine as an actor, he has his as a director. That's the best way. In addition, De Niro has played a number of Catholic characters in his movies. He played a Catholic penitent in the 1986 film The Mission. 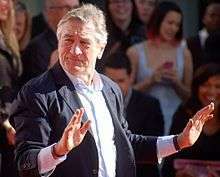 De Niro initially supported the inclusion of the controversial documentary about an alleged vaccination coverup, Vaxxed, at the 2016 Tribeca Film Festival. He explained his interest in the film resulted from his family experience with an autistic son. De Niro withdrew his recommendation after discussion with the scientific community. He said he was pressured by some festival filmmakers to remove Vaxxed from the festival line-up. He also said that he intends to be a part of the conversation around vaccines and autism moving forward. The director of the film, Andrew Wakefield, who is considered the father of the anti-vaccination movement, had reportedly been communicating with Grace Hightower and in one reported exchange sympathized with them saying: "your family's life [has] been blighted by autism". ↑ "BAFTA Film Awards: 1990". Bafta.org. February 11, 2014. Retrieved August 15, 2014. ↑ Shawn Levy (2014). De Niro: A Life. Crown Archetype. 1 2 "The Shadow King". Vanity Fair. 3 February 2014. 1 2 3 4 5 "Robert De Niro's Religion and Political Views". hollowverse.com. Retrieved February 16, 2016. 1 2 3 4 5 "The religion of Robert De Niro, actor". www.adherents.com. Retrieved February 16, 2016. ↑ Baxter, John (2002). De Niro: A Biography. HarperCollins. ISBN 978-0-00-257196-8. pp. 37–38. 1 2 Dougan, pp. 17–18. 1 2 Dougan, p. 17. ↑ "'There was a sense of exhilaration about what we had done'". The Guardian. UK. October 16, 2004. ↑ Brenner, Marie. "Tender is the Plight", Texas Monthly, January 1977. ↑ "15th Moscow International Film Festival (1987)". MIFF. Archived from the original on January 16, 2013. Retrieved February 18, 2013. ↑ "20th Moscow International Film Festival (1997)". MIFF. Archived from the original on March 22, 2013. Retrieved March 22, 2013. ↑ Hayes, Dade (May 17, 2007). "De Niro, Pacino reunite for 'Kill'". Variety. Retrieved August 20, 2008. ↑ Graham, Jamie (March 2007). "The Total Film Interview". Total Film (125): 105. ↑ Michael Fleming (September 4, 2008). "De Niro exits 'Edge of Darkness'". Variety. Retrieved September 4, 2008. ↑ Michael Fleming (September 12, 2008). "Winstone replaces De Niro in 'Edge'". Variety. Retrieved September 12, 2008. ↑ Jessica Satherley (October 7, 2010). "Monica Bellucci shows off her hourglass figure as she films with Robert De Niro in Rome". Daily Mail. UK. ↑ Vivarelli, Nick (August 31, 2010). "De Laurentiis: Serials killer at box office". Variety. Retrieved January 9, 2011. ↑ Satherley, Jessica (October 7, 2010). "Monica Bellucci shows off her hourglass figure as she films with Robert De Niro in Rome". Daily Mail. London. Retrieved January 9, 2011. ↑ Abrams, Natalie. "CBS Orders Robert De Niro Crime Pilot". tvguide.com. Retrieved January 21, 2011. ↑ "ROBERT DE NIRO, PRESIDENT OF THE JURY OF THE 64th FESTIVAL DE CANNES - Festival de Cannes 2014 (International Film Festival)". Festival-cannes.com. Retrieved August 15, 2014. ↑ Miller, Julie (February 5, 2013). "After His First Oscar Nomination in 21 Years, Robert De Niro Opens Up with Rare Interviews, Even Rarer Tears". Vanity Fair. Retrieved March 12, 2016. ↑ Bradley, Charles (April 8, 2015). "Robert De Niro to play legendary Enzo Ferrari in 'movie epic'". motorsport.com. ↑ Honan, William H. (August 23, 1989). "De Niro Is Trying Life Behind the Camera". The New York Times. ↑ Greenwich Hotel. Greenwich Hotel. Retrieved on August 14, 2010. ↑ "Locanda Verde". Zagat.com. May 12, 2009. ↑ De Niro teams up with his favorite chef for a new gem in Manhattan. Gourmet Magazine. Retrieved on August 15, 2010. ↑ "People Magazine". Google. Retrieved August 20, 2007. ↑ "New York Real Estate – Prudential Douglas Elliman". Elliman.com. Archived from the original on May 2, 2007. Retrieved January 9, 2011. ↑ "Toukie Smith and actor Robert De Niro become parents of twins". Jet. October 20, 1995. p. 36. Retrieved December 19, 2010. 1 2 "Drug allegations hit De Niro custody battle". The Guardian. London. July 26, 2001. Retrieved August 15, 2014. ↑ "Robert De Niro & Wife Welcome Baby Girl". People. December 23, 2011. Retrieved December 23, 2011. ↑ "Robert De Niro and wife welcome a child via surrogate". Daily Mail. London. December 24, 2011. Retrieved December 24, 2011. ↑ "Robert de Niro four grandchildren". Contactmusic.com. October 18, 2012. Retrieved August 15, 2014. ↑ De Niro welcomes another grandchild Archived September 14, 2011, at the Wayback Machine. ↑ "De Niro's daughter on him as a father and grandfather". Okmagazine.com. April 26, 2008. Retrieved August 15, 2014. ↑ "8 Famous Men With Prostate Cancer". Inhealth.cnn.com. July 12, 2012. Retrieved August 15, 2014. 1 2 Horrigan, Jeremiah (October 28, 2014). "Gardiner in battle for Robert De Niro's dinero". Times-Herald Record. Middletown, NY. Retrieved October 29, 2014. ↑ "Cinq ans de prison pour le photographe proxénète" [Five years in prison for pimp photographer]. Libération (in French). January 7, 1999. Retrieved May 15, 2013. ↑ "De Niro furious over French grilling". BBC News. February 24, 1998. Retrieved August 20, 2007. ↑ "De Niro chez le juge" [De Niro in court]. Libération (in French). May 8, 1999. Retrieved May 15, 2013. ↑ "Robert De Niro will be President of the Jury of the 64th Festival de Cannes". cannes.com. April 23, 2009. Retrieved August 29, 2013. ↑ Chaban, Matt A.V. (November 4, 2014). "De Niro, in Tax Fight, Wins Little Sympathy From His Neighbors". The New York Times. Retrieved November 20, 2014. ↑ Chaban, Matt A.V. (November 19, 2014). "De Niro and New York Town End Fight Over Property Taxes". The New York Times. Retrieved November 20, 2014. ↑ Horrigan, Jeremiah (November 19, 2014). "De Niro ends tax assessment fight". Times-Herald Record. Retrieved November 20, 2014. ↑ "Scepticism and support swirl around Clinton". BBC News. December 17, 1998. Retrieved August 20, 2007. ↑ Slattery, Denis (April 3, 2015). "Robert De Niro backing Hillary Clinton if she runs in 2016". New York Daily News. Retrieved June 20, 2015. ↑ "De Niro, Damon: Spies, patriotism and politics". MSNBC. Retrieved August 20, 2007. ↑ Mireya Navarro (29 August 2012). "Yoko Ono and Sean Lennon Organize Artists Against Fracking". New York Times. Retrieved 17 May 2016. ↑ "Robert De Niro: 'I'd like to punch Donald Trump in the face' – video". The Guardian. Retrieved 8 October 2016. ↑ "Robert De Niro reveals he was the one to push for anti-vaccine movie at Tribeca". Los Angeles Times. March 25, 2016. 1 2 3 "Robert De Niro steps into autism vaccination row by screening film". The Guardian. March 26, 2016. Retrieved March 26, 2016. 1 2 Offit, Paul (April 11, 2016). "Anti-Vaccine Doc 'Vaxxed': A Doctor's Film Review". Hollywood Reporter. Retrieved April 12, 2016. ↑ Merlan, Anna (March 26, 2016). "Tribeca Film Festival, Robert De Niro Announce They're Pulling Anti-Vax Film From Schedule". Jezebel (website). Retrieved March 27, 2016. ↑ . (April 13, 2016). "Robert De Niro on anti-vaccine film controversy: 'Let's find out the truth'". Today show. Retrieved April 14, 2016. ↑ Ziv, Stav (February 10, 2015). "Andrew Wakefield, Father of the Anti-Vaccine Movement, Responds to the Current Measles Outbreak for the First Time". Newsweek. Retrieved March 20, 2016. ↑ Carey, Matt (April 22, 2015). "Andrew Wakefield to Grace Hightower: "your family's life [has] been blighted by autism"". Left Brain/Right Brain. Retrieved April 23, 2016. Baxter, John (2002). De Niro: A Biography. HarperCollins. ISBN 978-0-00-257196-8. Dougan, Andy (2003). Untouchable: A Biography of Robert De Niro. Da Capo Press. ISBN 1-56025-469-6. Wikimedia Commons has media related to Robert De Niro.